Industrial robots are no longer preserved for a select few companies. And they aren’t so much coming: they have now fully arrived. Between 2015 and 2016, the average number of robot workers globally increased from 66 units per 10,000 human workers to 74. This density shows no signs of slowing according to data from the International Federation of Robotics (IFR), that reveals the number of installed industrial robots within the global manufacturing industry in 2016. South Korea had 631 robots per 10,000 human workers, the most of any nation. The IFR says this is thanks largely to the installation of a high volume of robots - particularly in the electrical/electronics and automotive industries. Singapore follows, with 488 installed robots for every 10,000 people. Roughly 90% of robots in Singapore are installed in the electronics industry, IFR says. Germany is Europe’s most automated country, ranking third worldwide. It has 309 robot workers per 10,000 people. According to the IFR, Germany also accounted for 41% of total robot sales in Europe in 2016, with supply expected to grow by 5% between 2018 and 2020. A number of other European countries also had far more robot workers than the global average. Sweden had 223 robots, Denmark had 211, Italy and Belgium had 185 and 184, respectively. The United Kingdom, however, was the only major G7 economy with fewer robots (71) per 10,000 workers than the global average in 2016. The IFR says in the UK, industry is in need of investment to modernize and increase productivity. “The low robot density rate is indicative of this fact,” it says. In eastern Europe, including Slovenia (137 units) and Slovakia (135 units), robot densities are increasing. In the Czech Republic, which had 101 robots per 10,000 workers, the fast-growing economy means plant owners are increasingly turning to machines. Speaking in the New York Times, Zbynek Frolik, whose company, Linet, makes state-of-the-art hospital beds, said the company has struggled to employ enough humans. “We’re trying to replace people with machines wherever we can,” he says. What’s more, a recent report by global management consultants McKinsey predicts more than a fifth of the global labour force - or 800 million workers - could lose their jobs because of automation. While these might be extreme examples, and the realization of a fear many workers have about the advance of automation, the number of robotic workers is only likely to increase in the coming years. 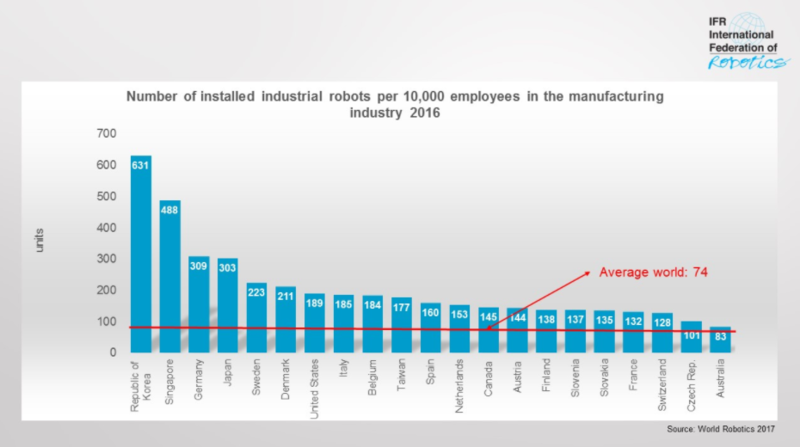 In the United States, the world’s largest economy, robot density surged in 2016 to 189 installations per 10,000 workers. According to the IFR, the main driver impacting growth was the trend to automate production in order to strengthen American industries on the global market and to keep manufacturing “at home”. South of the border, Mexico had 33 robot workers per 10,000 people. This is despite it being a automotive production hub that predominantly exports to the United States. 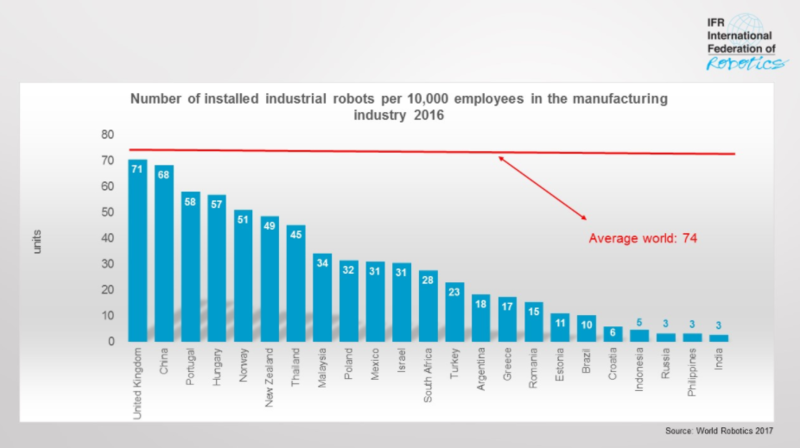 And while South Korea and Singapore lead the global and Asian markets in terms of installations, China has also seen a surge in robot worker numbers. Although it had just 68 units per 10,000 people in 2016, this was almost triple the number in had three years earlier (25). 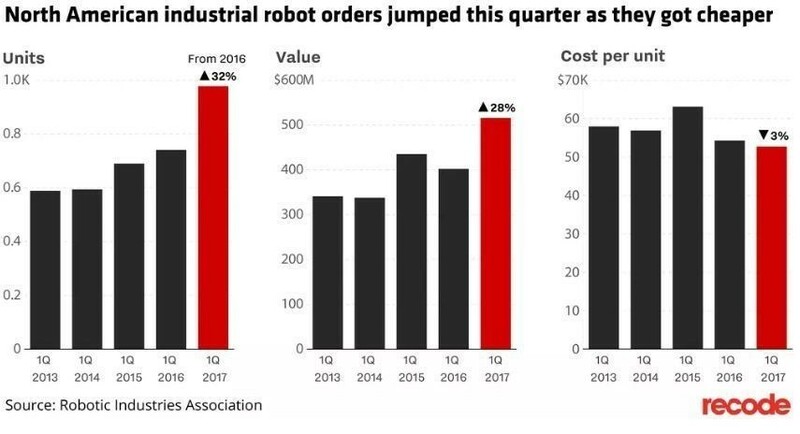 Sales of industrial robots are surging. So what does this mean for human workers? The government intends to continue this growth, pledging to break into the world’s top 10 most intensively automated nations by 2020. By then, its robot density is targeted to rise to 150 units, IFR says. Furthermore, the aim is to sell a total of 100,000 domestically produced industrial robots by 2020.